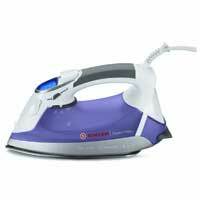 The LCD display on this Singer steam iron handily shows you which fabrics are best for each temperature setting, so you’ll get the best ironing results. The steam functions are comprehensive and effective, taking out all the wrinkles in clothes. We found that the iron glides easily, and with an open tip it works its way around buttons without snagging. While the cord is extra long, it would have been nice to have a retractable feature or an easier way to wrap it up for storage. Regardless, for $64.19, this Singer model has superb steam functions and easy-to-use controls.